WHAT SHOULD I DO FOR MY NEW TV? 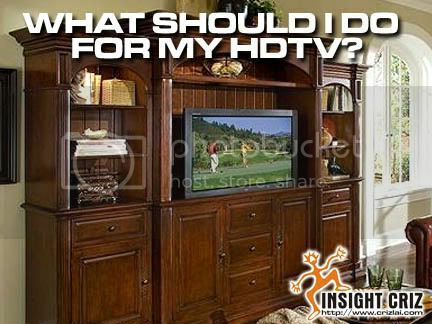 I had spent many month browsing through the web in search for a good HDTV for my living room. All the reviews and recommendations were detailed but I had some problems with the price tags. Some of the best would cost between $3K and $4.5K which was way beyond my budget. After considering the prices for brands such as Sony, Panasonic, Toshiba, Pioneer, Samsung, LG and many others, I finally settled for Samsung HL52A650 which would cost me around $2K or more. Although it is relatively expensive and with a red frame, it has a superb black-level performance; highly accurate color; improved 120Hz de-judder video processing; fine standard-definition processing; broad selection of picture setup options; ability to display weather, news, and stock info onscreen; energy-efficient compared with most like-size LCDs. Since this model is one of the top selling models in 2008, I better get it fast before it goes out of stock. I should also be looking for new tv lifts as my existing TV cabinet would not be able to fit in this new 52” LCD TV. I guessed I should not have any problems at all as I have already found out where to get the best deal. Previous PostPrevious I CANNOT SEE MY TOES! Next PostNext WHAT IS THE BEST WAY TO GET GOOD INVESTMENTS?